I was recently told a very plausible and fascinating story about the origin of the word marmelade. The future Mary Queen of Scots was brought up in France, mostly in the Castle of Amboise just down the road from us. She was often sick because she had no appetite until someone finally came up with a special treat – a jelly called marmelade because it was made for Marie Malade (sick Mary). Sad to say, the story is not true. Marmelada comes from the Portuguese marmelo meaning quince and is a sort of quince paste introduced into England in about 1480, and predates Mary Queen of Scots who was born in 1542. She may well have liked it but is not responsible for the name! Note the different spelling in French and English – the second “a” becomes an “e” in French. You don’t often see marmalade in France so for my Christmas Cake I use confiture d’écorce d’orange (écorce = peel) which seems to work just as well. 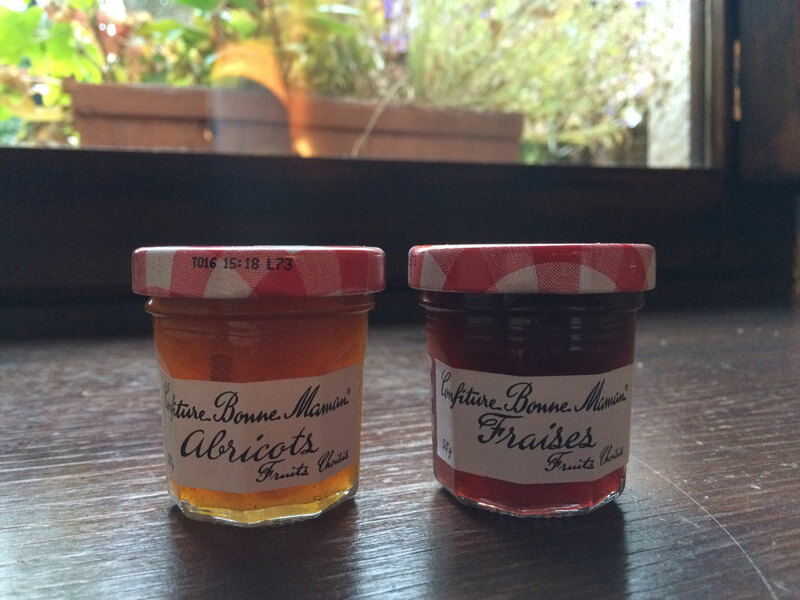 For some reason that I have never fathomed, the most popular jams in France are strawberry and apricot, neither of which I like. Even at Angelina’s, they are the only choice available! 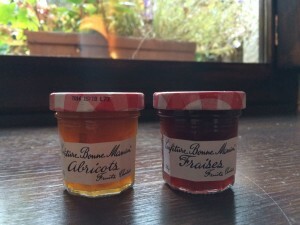 The word confiture comes from the verb confire in French and the Latin conficere meaning to completely finish (past participle confectus which you will recognise in confectionery). Confiture, introduced into French in the late 18th century, initially meant fruit cooked in sugar (candied fruit, stewed fruit, etc.) before being limited to jam in the 19th century. The English jam, on the other hand, derives from the verb “to jam” meaning to crowd, squeeze or block because the jam we eat is the result of a congestion or the resulting stoppage. You may remember from reading Victorian novels that everyone used to make “preserves”. The French equivalent is conserves. And, just to avoid any future blunders, a préservatif is a French letter or condom as it’s called today. There is a little town in France called Condom, by the way. I have only been able to find one expression containing the word confiture in French: Donner de la confiture aux cochons whose English equivalent, which I have never heard before (oh where is my general knowledge?) is “Throw pearls before swine” which refers to a quotation from Matthew 7:6 in Jesus’s Sermon on the Mount: “Do not give what is holy to the dogs; nor cast your pearls before swine, lest they trample them under their feet, and turn and tear you in pieces.” Should we read any significance into the fact that this has been translated as confiture in French? The country of gastronomie? In English we have traffic jams which are embouteillages in French from bouteille meaning bottle, the equivalent of our bottlenecks. I’m sure you know lots of other expressions using “jam”. Do you know their equivalents in French as well? This entry was posted in Cooking, Food, French language and tagged confiture in English, Friday's French, jam in French, origin of confiture, origin of jam, préservatif. Bookmark the permalink. You could also have mentioned that in American English jam/confiture is jelly, and jelly is a gelatine dessert in British English, which is called by the brand name jello in American English. Proper Portuguese marmelado is called quince cheese or quince paste in British English. It is really delicious and you have reminded me I have a box of quince puree in the freezer which I must make up into marmelado. I agree about the unaccountable popularity of apricot or strawberry jam. Our neighbour only eats apricot. And why would anyone bother with strawberry jam when they can get raspberry is the question I ask myself. I didn’t realise that jelly was jam in American English. I remember eating apple jelly jam as a child in Australia. And thank you for the information about marmelado being called quince cheese (???) or quince paste. Shall I look forward to tasting your marmelado? Yes, I can’t imagine anyone preferring strawberry to raspberry jam and since I don’t actually like strawberries very much, it’s more of a mystery still. The French are made about strawberries in any case. however, Pauline’s raspberry jelly is to die for!! it goes a lot further. I would LOVE Pauline’s raspberry jelly. I don’t make my own because I love raspberries so much that I think they are wasted on jelly! Thank you mm, we’re getting there. Interesting information about the ratio of sugar to fruit in jams and that preserves have a higher ratio of fruit. I’ll have to look into it here. I don’t recall if I’ve ever had apricots, let alone apricot jam. I prefer cherry, blueberry, or raspberry jams. William, they are exactly my favourites as well!